This year London will host one of the world’s most iconic sporting events. The entire world will come together through their teams to compete and celebrate the passion and determination of their athletes. To celebrate, DegreeArt has invited twenty of Britain’s most coveted athletes competing in the summer Olympics to work with twelve of our established and sought after artists. Each athlete will pair with an artist(s) and through his or her dreams, ambition and individuality will display their discipline through diverse artistic mediums. 20:12 will mark one of London’s most exciting games, and twenty of our British athletes will not only leave a sporting legacy, but will also be part of art history as well. Michael’s painting of Elvis Presley will be featured in Roger G. Taylor’s forthcoming book ‘Elvis In Art’, comprising over 200 paintings and drawings of 'the king of rock 'n' roll', Elvis Presley. Each portrait is accompanied by quotes by Elvis himself or from people who knew him or worked with him. 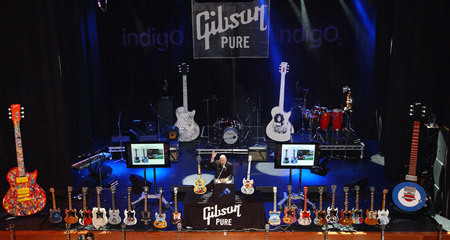 Thirty 10-foot free standing fiberglass Gibson Les Paul guitars have been creatively designed and hand painted by visual artists ranging from some of the UK’s leading and established artists such as Sir Peter Blake and Gerald Scarfe. Each guitar will be signed by the associated music legend to authenticate and endorse their individual guitar. Hand painted for legendary rocker Rod Stewart, Michael English’s guitar features a blonde lady in the colours of Rod's favourite football team Celtic and is titled "You Wear It Well". The guitar can be seen around More London, SE1 from June 28th. Following a ten-week public display the guitar will be auctioned of for The Princes Trust, Nordoff-Robbins Music Therapy and Teenage Cancer Trust.